Your privacy, security and service, when online, are as important to us as when you use the rest of our services. For this reason, we employ all of the safeguards mentioned above, along with the following Internet-specific practices. PSE Credit Union, Inc. uses a variety of proven protections to preserve the security of your on-line session. We make extensive use of firewall barriers, encryption techniques and authentication procedures. To aid you in your site navigation and to personalize your experience on our site we may also place cookies and similar files (for security purposes) on your hard drive. When you visit PSE Credit Union's Internet site(s), we may collect technical and navigational information, such as IP address, browser type, pages visited and average time spent on our web site(s). This information may be used to alert you to software compatibility issues or it may be analyzed to improve our web design and functionality. Offsite Links and E-mail: PSE Credit Union, Inc. does not regularly check the contents of the links provided to sites outside of its own. These links are neither supported by nor endorsed by PSE Credit Union. They are only provided as a service to our members. If you encounter anything that you find to be questionable, please e-mail the web designer at info@perceptionmm.com. For security reasons, it is the practice of the credit union to never ask for your password, account number, social security number or any other personally identifiable information via our general e-mail system. If you receive an e-mail requesting this type of information or any other suspicious looking e-mail, please do not click on any link within the e-mail message and contact the credit union immediately at 440-545-5147. 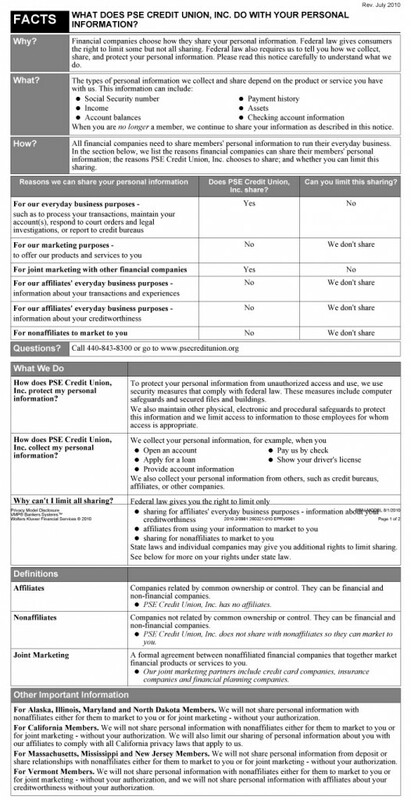 Consistent with the Federal Children’s Act of 1998, PSE Credit Union will not collect, use or disclose online information received from children under age 13 without prior parental notification and consent, which will include an opportunity for the parent to prevent use of information and participation in the activity. Online information will only be used to respond directly to the child’s request and will not be used for other purposes without prior parental consent. The Credit Union will not distribute to third parties, other than its affiliate, personally identifiable information without prior parental consent. The Credit Union will not post or otherwise distribute personally identifiable information without prior parental consent. The Credit Union will not entice by the prospect of a special game, prize or other activity, to divulge more information than is needed to participate in the activity. Personally identifiable information collected online from their children may be viewed by a parent or guardian upon written request. The parent or guardian has a right to have information deleted and instruct the Credit Union to cease collecting further information from their child.